Four years ago, Tommy Duquette's Olympic dream lay in tatters. After entering the USA Boxing trials ranked #2, he seemed destined for the ultimate honour: representing his country at the London 2012 games. But Duquette was defeated on a Level 3 tie after holding a commanding lead after two rounds. With the scores level, it took judges two additional scoring metrics to separate the fighters. In football terms, it's the equivalent of losing on corners. So Tommy went home to finish college, a glittering national career over after 136 bouts. The man whose hand was raised that day went on to London. "Making the Olympic team was my dream. Losing by such a small margin, you question yourself a lot," he told Wareable. "If you did one thing slightly different would it have made the difference? Not only during the fight, but in training? Could I have trained harder, hit the bag harder, ran harder, sparred an extra day? "On the flip side, was I burning myself out? Should I have taken a rest? At the time those decisions were taken on instinct." Rather than wallow, Duquette has channelled his energy into a wearable device that can ensure the next generation of Olympians never have to ask: "What if?" He co-founded Hykso, the maker of a sensor that calculates the amount of punches being thrown, as well as the types and speed of those punches. It is worn inside the fighter's wraps and uses two independent accelerometers plus a gyroscope for full 3D motion tracking at a rate of 1,000 times per second. During and after sparring sessions it gives detailed breakdowns of the workouts, allowing fighters to see tangible improvements in speed and volume and enabling them to quantify whether they're throwing targeted percentages of any punch type. "When you take total punches, the distribution, the speed of those punches it paints a really detailed picture and allows the coach to draw a lot of insights," the Babson College graduate said. "These metrics are really important. If you're not throwing X% jabs, you're not fighting smart. These guys have quotas and the real-time numbers seem to hold them accountable. If they throw X punches per round, they know the win is more likely." As well as assisting fighters on the US and Canadian boxing teams, the Hykso sensor has also enabled coaches to save hours and hours of time previously spent in the video room. "Billy Walsh is a really smart, data-driven coach at USA boxing. He found the number one determinate of success in an Olympic-style fight was a metric called time between attacks. The shortest amount of time you can have between attacks, the most likely you are to win. "To establish this for fighters they had to watch hundreds of hours of video in slow motion, frame by frame and write everything down. Because our sensors take a time stamp down to the millisecond for every punch thrown, we run a script and we do it automatically." The data is rubbing off on the athletes too, including Olympic medal hopeful Mikaela Mayer, who'll head to Rio seeking Lightweight gold. "The most important thing I've picked up," she said, "is I used to punch every five to six seconds. Now I punch every three to four seconds. That's something I would never have thought about. I don't just think I'm improving, statistically, I know I'm improving." The ability to help athletes quantify performance and learn from the data was crucial to the US Olympic Committee's decision to bring Hykso sensors inside its rings. The USOC director of technology and innovation Mounir Zok has overseen an influx of wearable devices into training regimens. His job? To bring these emerging start-ups into the fold before the products become widely available to consumers. That way, team USA experiences the benefits before others can. Hykso's consumer model (four times smaller than the original) won't be available until the summer and currently only 35 beta kits exist in the wild. That's pretty exclusive. "My job is all about gaining that extra 1% edge by leveraging emerging technology," Zok told us. "We have to get our hands on it before it's available to the masses and drive excellence within Team USA. "This Olympic Games will be the first wearable technology games. We've reached the stage where athletes can use it without interfering with their activity. "Our aim is to use the wearable technology to help the athletes and coaches make the best decisions possible. If you can help them understand how their bodies are performing you have influenced their decision making process." Zok is working with athletes across the entire scope of Olympic disciplines, in boxing, diving, cycling, gymnastics, wrestling, track and field and many more. Each item of tech is bringing insights that have until now been inaccessible, or only accessible through archaic, labour intensive methods. "It has started to answer so many questions athletes and coaches have been asking for such a long time," he said. "Boxers have been trying to get their hands on the speed of their punch forever. "Our divers are wearing tiny waterproof sensors that tell them how high they jumped and how long it took them to get into their first spin. "Now, as soon as they step out of the ring or the pool they can see a screen with all of the data points they're after. It's a huge boost in learning. Their consciousness of their body increases and automatically and mathematically their performance increases." In terms of Olympic disciplines, boxing is about as far away from cycling as a shot putter is from winning the 100m dash. However, the USOC has secured early access to another wearable device that's as yet unavailable to consumers. 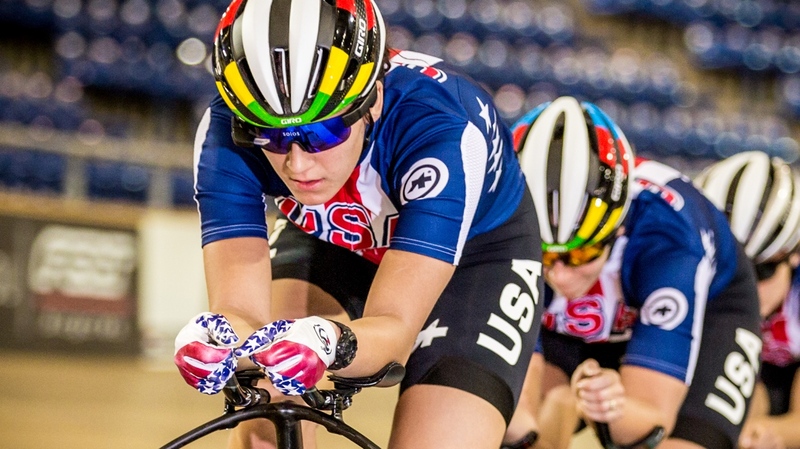 The Solos Smart Eyewear has been developed alongside USA Cycling, and designed explicitly for their needs. As well as being a high quality pair of sunglasses, it also features a heads-up display that's smaller than the human pupil. The display itself was developed over 30 years by parent company Kopin, and a former US defence contractor. Instead of powering US solders on the battlefield, though, the tech is now being used to fire US Olympians to gold. The 'Pupil' display sits directly in the eyeline of the cyclist, allowing them to see key metrics like speed, power, distance, cadence and heart rate, plus more data from any number of connected sensors. It's small enough that just a slight adjustment of the gaze will see the heads up display disappear, clearing the path ahead and allowing the cyclist to keep their eyes on the road without ever needing to look down at a bike computer. "The advantage of having info displayed in FOV without being distracted at same time is huge," Dr Ernesto Martinez, the Director of Solos told us. "Now the coach can set a specific goal and the athlete can follow it and know whether they're behind or ahead or just right. "Now, quite literally they're not training blind. They're not looking at the data after. They're able to adjust their speed or cadence or power so they could match indications from the coach." Double Olympic silver medallist from the London Games and multiple time World Champion Sarah Hammer is a believer. She's hoping training with the Solos will help her leap to the top of the podium in Rio. Contests at this level are decided by the smallest margins possible. If you can get any tiny little legal edge in sports, you need to take it. Your career depends on it. She told us by email: "Solos has been an incredible addition to my arsenal of training technology. The heads up display features have given me the opportunity to see and interact with my training at a whole new level. "Being able to see data in real-time is no longer a 'nice to have'. In order to be at the top of my game, I need to see what's going on, while it's going on. Not after the training session. "The fact that Solos has afforded me the opportunity to do this safely, without taking my eyes off the road has been a huge leap forward for my training," she continued. "The transparent display causes zero obstruction of view. The data is there when you want it to be, and basically hidden when you're not looking at it." Solos is currently available to back on Kickstarter, selling a refined model of that currently being used by Team USA. It'll be available for just $500 in October. Until then there's a small matter of the games in Rio De Janeiro, which started on 5 August. Can this biomechanical evolution really ensure the US Olympic team can up their routinely enormous medal tally this summer? "I think it's big," says Hykso's Tommy Duquette. "Contests at this level are decided by the smallest margins possible. If you can get any tiny little legal edge in sports, you need to take it. Your career depends on it." Few know that better than Duquette. "I wish I'd had it," he says.